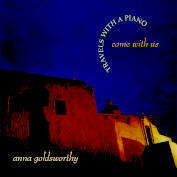 Anna Goldsworthy has created a travelogue with her piano - each piece is from a different part of the world. Rare pieces by Tan Dun, China's most famous living composer and Greek composer Manos Hadjidakis are heard alongside more familiar pieces by Janacek and Ravel. The CD is illustrated with magnificent photographs by renowned photographer Nicholas Purcell. An evocative and stimulating global musical voyage.